After visiting the beautiful Chartres Cathedral, we headed to Restaurant Le Pichet for a tasty and simple lunch in a traditional setting. People go to Chartres to see the beautiful Cathédrale de Notre-Dame de Chartres, with its magnificent stained glass. It's an easy trip by train from Paris, and well worth a day trip. After spending the morning admiring the stained glass and walking the labyrinth, we were ready for some lunch. Walking from the train station to the Cathedral, we had passed several restaurants and decided on Le Pichet, a traditional French restaurant. 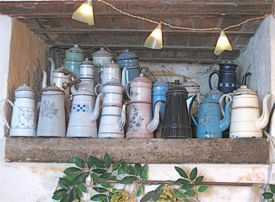 A pichet is a jar or pitcher, and the restaurant's decor builds on its name, with colorful pots and jars hanging on the walls and displayed on shelves. The red-and-white checked tablecloths create a traditional and homey atmosphere. The restaurant offers lunch menus for 12€ to 15€, as well as à la carte items. 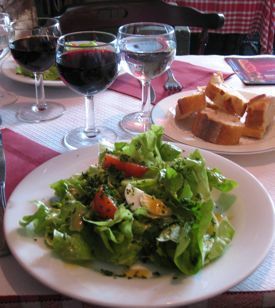 We took the two-course menu and enjoyed salad, followed by chicken served with frites (French fries) and vegetables. The food was simple but tasty, nothing fancy but perfect for our needs. With a small pichet of wine and two coffees, our total bill for two came to 38€. Thus fortified, we returned to the Cathedral to continue to study the stained glass! Before leaving, we also strolled through the pleasant town of Chartres, noting several other restaurants and attractive areas. Above, Decor at Le Pichet, Chartres, France. to start a meal at Le Pichet.